A brief glimpse at Rachael Qualls’ resumé will convince you that she’s a true innovator in the world of venture capital and angel investing. 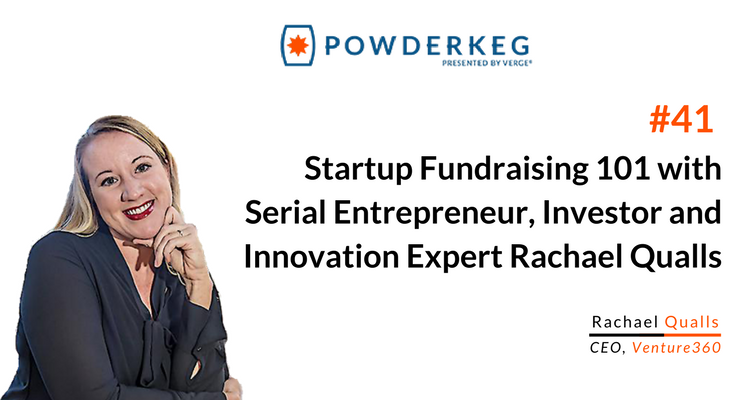 A brief meeting with her at a Powderkeg pitch night in Kansas City, MO, convinced me that I had to invite her on the podcast to share her deep knowledge of fundraising and investing with our community of entrepreneurs. Qualls has a decade of experience building and investing in companies, first among the flourishing tech ecosystem in Nashville, TN, and now in her hometown of Kansas City. She’s seen firsthand how difficult it is for founders to raise money, and she’s passionate about making it easier. Her current company, Venture360, aims to do this through a private equity portfolio management platform that helps entrepreneurs and investors close deals and track investments with fewer hassles. In our interview, Qualls gives in-depth and practical advice on all things fundraising, touching on such topics as researching investors, generating interest, assembling an appealing pitch deck and making a good impression at your first meeting. Qualls is also an expert on innovation, and she provides insight into the latest industry trends—online investing, crowdfunding and ICOs—and how they’re likely to revolutionize investing in the near future. This episode is packed with insider information that should provide valuable context for any founder or investor looking to increase their fundraising IQ. It should also be an enlightening resource for anyone interested in the current state of investing and the exciting places the industry is headed. Please enjoy this conversation with Rachael Qualls! Did you enjoy this conversation? Thank Rachael on Twitter! Click here to say hi and thank Rachael Qualls on twitter! What stood out most to you about what Rachael Qualls share in this podcast? For me, it’s the expert tips for assembling your pitch deck and meeting with investors.